DVD-RW (DVD ReWritable) is a rewritable format that is closely related to DVD-R, and is recorded by similar drives. 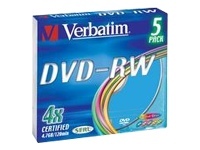 DVD-RW is a sequential read/write media primarily designed for video recording and streaming computer backup applications. DVD-RW discs can be written over 1, 000 times. A number of DVD-ROM drives and DVD Video players support DVD-RW.